A particle accelerator is a device that uses electromagnetic fields to propel charged particles to high speeds and to contain them in well-defined beams. Large accelerators are best known for their use in particle physics as colliders (e.g. the LHC at CERN, RHIC at Brookhaven National Laboratory, and Tevatron at Fermilab). Other kinds of particle accelerators are used in a large variety of applications, including particle therapy for oncological purposes, and as synchrotron light sources for the study of condensed matter physics. There are currently more than 30,000 accelerators in operation around the world. Rolf Widerøe, Gustav Ising, Leó Szilárd, Donald Kerst, and Ernest Lawrence are considered pioneers of this field, conceiving and building the first operational linear particle accelerator, the betatron, and the cyclotron. Because colliders can give evidence of the structure of the subatomic world, accelerators were commonly referred to as atom smashers in the 20th century. Despite the fact that most accelerators (but not ion facilities) actually propel subatomic particles, the term persists in popular usage when referring to particle accelerators in general. Beamlines leading from the Van de Graaff accelerator to various experiments, in the basement of the Jussieu Campus in Paris. Breakdown of the cumulative number of industrial particle accelerators according to their applications. 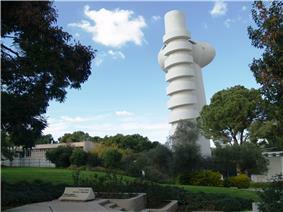 The now disused Koffler particle accelerator at the Weizmann Institute, Rehovot, Israel. Beams of high-energy particles are useful for both fundamental and applied research in the sciences, and also in many technical and industrial fields unrelated to fundamental research. It has been estimated that there are approximately 26,000 accelerators worldwide. Of these, only about 1% are research machines with energies above 1 GeV, while about 44% are for radiotherapy, 41% for ion implantation, 9% for industrial processing and research, and 4% for biomedical and other low-energy research. The bar graph shows the breakdown of the number of industrial accelerators according to their applications. The numbers are based on 2012 statistics available from various sources, including production and sales data published in presentations or market surveys, and data provided by a number of manufacturers. The largest particle accelerators with the highest particle energies are the Relativistic Heavy Ion Collider (RHIC) at Brookhaven National Laboratory and the Large Hadron Collider (LHC) at CERN (which came on-line in mid-November 2009) These accelerators are used for experimental particle physics. For the most basic inquiries into the dynamics and structure of matter, space, and time, physicists seek the simplest kinds of interactions at the highest possible energies. These typically entail particle energies of many GeV, and the interactions of the simplest kinds of particles: leptons (e.g. electrons and positrons) and quarks for the matter, or photons and gluons for the field quanta. Since isolated quarks are experimentally unavailable due to color confinement, the simplest available experiments involve the interactions of, first, leptons with each other, and second, of leptons with nucleons, which are composed of quarks and gluons. To study the collisions of quarks with each other, scientists resort to collisions of nucleons, which at high energy may be usefully considered as essentially 2-body interactions of the quarks and gluons of which they are composed. Thus elementary particle physicists tend to use machines creating beams of electrons, positrons, protons, and antiprotons, interacting with each other or with the simplest nuclei (e.g., hydrogen or deuterium) at the highest possible energies, generally hundreds of GeV or more. Nuclear physicists and cosmologists may use beams of bare atomic nuclei, stripped of electrons, to investigate the structure, interactions, and properties of the nuclei themselves, and of condensed matter at extremely high temperatures and densities, such as might have occurred in the first moments of the Big Bang. These investigations often involve collisions of heavy nuclei – of atoms like iron or gold – at energies of several GeV per nucleon. Particle accelerators can also produce proton beams, which can produce proton-rich medical or research isotopes as opposed to the neutron-rich ones made in fission reactors; however, recent work has shown how to make 99Mo, usually made in reactors, by accelerating isotopes of hydrogen, although this method still requires a reactor to produce tritium. An example of this type of machine is LANSCE at Los Alamos. Besides being of fundamental interest, high energy electrons may be coaxed into emitting extremely bright and coherent beams of high energy photons via synchrotron radiation, which have numerous uses in the study of atomic structure, chemistry, condensed matter physics, biology, and technology. Examples include the ESRF in Grenoble, France, which has recently been used to extract detailed 3-dimensional images of insects trapped in amber. Thus there is a great demand for electron accelerators of moderate (GeV) energy and high intensity. Everyday examples of particle accelerators are cathode ray tubes found in television sets and X-ray generators. These low-energy accelerators use a single pair of electrodes with a DC voltage of a few thousand volts between them. In an X-ray generator, the target itself is one of the electrodes. A low-energy particle accelerator called an ion implanter is used in the manufacture of integrated circuits. At lower energies, beams of accelerated nuclei are also used in medicine as particle therapy, for the treatment of cancer. DC accelerator types capable of accelerating particles to speeds sufficient to cause nuclear reactions are Cockcroft-Walton generators or voltage multipliers, which convert AC to high voltage DC, or Van de Graaff generators that use static electricity carried by belts. 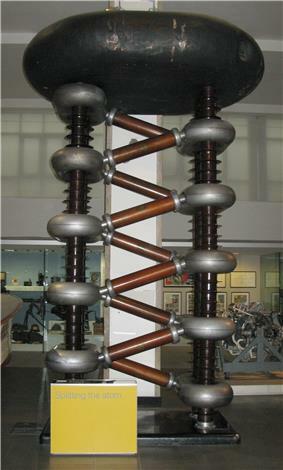 A Cockcroft-Walton generator (Philips, 1937), residing in Science Museum (London). Historically, the first accelerators used simple technology of a single static high voltage to accelerate charged particles. While this method is still extremely popular today, with the electrostatic accelerators greatly out-numbering any other type, they are more suited to lower energy studies owing to the practical voltage limit of about 30 MV (when the accelerator is placed in a gas with high dielectric strength, such as sulfur hexafluoride, allowing the high voltage). The same high voltage can be used twice in a tandem accelerator if the charge of the particles can be reversed while they are inside the terminal; this is possible with the acceleration of atomic nuclei by first adding an extra electron or forming an anionic (negatively charged) chemical compound, and then putting the beam through a thin foil to strip off electrons inside the high voltage conducting terminal, making a beam of positive charge. Although electrostatic accelerators accelerate particles along a straight line, the term linear accelerator is more often associated with accelerators that use oscillating rather than static electric fields. Thus, many accelerators arranged in a straight line are not termed "linear accelerators" but rather "electrostatic accelerators" to differentiate the two cases. Due to the high voltage ceiling imposed by electrical discharge, in order to accelerate particles to higher energies, techniques involving more than one lower, but oscillating, high voltage sources are used. The electrodes can either be arranged to accelerate particles in a line or circle, depending on whether the particles are subject to a magnetic field while they are accelerated, causing their trajectories to arc. 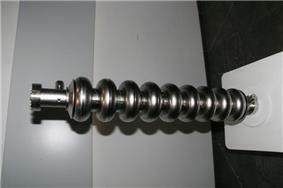 Modern superconducting, multicell linear accelerator component. In a linear particle accelerator (linac), particles are accelerated in a straight line with a target of interest at one end. They are often used to provide an initial low-energy kick to particles before they are injected into circular accelerators. The longest linac in the world is the Stanford Linear Accelerator, SLAC, which is 3 km (1.9 mi) long. SLAC is an electron-positron collider. Linear high-energy accelerators use a linear array of plates (or drift tubes) to which an alternating high-energy field is applied. As the particles approach a plate they are accelerated towards it by an opposite polarity charge applied to the plate. As they pass through a hole in the plate, the polarity is switched so that the plate now repels them and they are now accelerated by it towards the next plate. Normally a stream of "bunches" of particles are accelerated, so a carefully controlled AC voltage is applied to each plate to continuously repeat this process for each bunch. As the particles approach the speed of light the switching rate of the electric fields becomes so high that they operate at radio frequencies, and so microwave cavities are used in higher energy machines instead of simple plates. Linear accelerators are also widely used in medicine, for radiotherapy and radiosurgery. Medical grade linacs accelerate electrons using a klystron and a complex bending magnet arrangement which produces a beam of 6-30 MeV energy. The electrons can be used directly or they can be collided with a target to produce a beam of X-rays. The reliability, flexibility and accuracy of the radiation beam produced has largely supplanted the older use of Cobalt-60 therapy as a treatment tool. In the circular accelerator, particles move in a circle until they reach sufficient energy. The particle track is typically bent into a circle using electromagnets. The advantage of circular accelerators over linear accelerators (linacs) is that the ring topology allows continuous acceleration, as the particle can transit indefinitely. Another advantage is that a circular accelerator is smaller than a linear accelerator of comparable power (i.e. a linac would have to be extremely long to have the equivalent power of a circular accelerator). Depending on the energy and the particle being accelerated, circular accelerators suffer a disadvantage in that the particles emit synchrotron radiation. When any charged particle is accelerated, it emits electromagnetic radiation and secondary emissions. As a particle traveling in a circle is always accelerating towards the center of the circle, it continuously radiates towards the tangent of the circle. This radiation is called synchrotron light and depends highly on the mass of the accelerating particle. For this reason, many high energy electron accelerators are linacs. 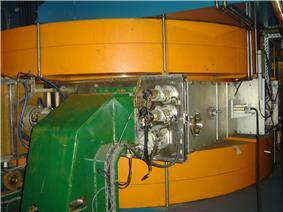 Certain accelerators (synchrotrons) are however built specially for producing synchrotron light (X-rays). Since the special theory of relativity requires that matter always travels slower than the speed of light in a vacuum, in high-energy accelerators, as the energy increases the particle speed approaches the speed of light as a limit, but never attains it. Therefore particle physicists do not generally think in terms of speed, but rather in terms of a particle's energy or momentum, usually measured in electron volts (eV). An important principle for circular accelerators, and particle beams in general, is that the curvature of the particle trajectory is proportional to the particle charge and to the magnetic field, but inversely proportional to the (typically relativistic) momentum. The earliest operational circular accelerators were cyclotrons, invented in 1929 by Ernest O. Lawrence at the University of California, Berkeley. Cyclotrons have a single pair of hollow 'D'-shaped plates to accelerate the particles and a single large dipole magnet to bend their path into a circular orbit. It is a characteristic property of charged particles in a uniform and constant magnetic field B that they orbit with a constant period, at a frequency called the cyclotron frequency, so long as their speed is small compared to the speed of light c. This means that the accelerating D's of a cyclotron can be driven at a constant frequency by a radio frequency (RF) accelerating power source, as the beam spirals outwards continuously. The particles are injected in the centre of the magnet and are extracted at the outer edge at their maximum energy. Cyclotrons reach an energy limit because of relativistic effects whereby the particles effectively become more massive, so that their cyclotron frequency drops out of synch with the accelerating RF. Therefore simple cyclotrons can accelerate protons only to an energy of around 15 million electron volts (15 MeV, corresponding to a speed of roughly 10% of c), because the protons get out of phase with the driving electric field. If accelerated further, the beam would continue to spiral outward to a larger radius but the particles would no longer gain enough speed to complete the larger circle in step with the accelerating RF. To accommodate relativistic effects the magnetic field needs to be increased to higher radii like it is done in isochronous cyclotrons. An example for an isochronous cyclotron is the PSI Ring cyclotron in Switzerland, which provides protons at the energy of 590 MeV which corresponds to roughly 80% of the speed of light. The advantage of such a cyclotron is the maximum achievable extracted proton current which is currently 2.2 mA. The energy and current correspond to 1.3 MW beam power which is the highest of any accelerator currently existing. A classic cyclotron can be modified to increase its energy limit. The historically first approach was the synchrocyclotron, which accelerates the particles in bunches. It uses a constant magnetic field B, but reduces the accelerating field's frequency so as to keep the particles in step as they spiral outward, matching their mass-dependent cyclotron resonance frequency. This approach suffers from low average beam intensity due to the bunching, and again from the need for a huge magnet of large radius and constant field over the larger orbit demanded by high energy. The second approach to the problem of accelerating relativistic particles is the isochronous cyclotron. In such a structure, the accelerating field's frequency (and the cyclotron resonance frequency) is kept constant for all energies by shaping the magnet poles so to increase magnetic field with radius. Thus, all particles get accelerated in isochronous time intervals. Higher energy particles travel a shorter distance in each orbit than they would in a classical cyclotron, thus remaining in phase with the accelerating field. The advantage of the isochronous cyclotron is that it can deliver continuous beams of higher average intensity, which is useful for some applications. The main disadvantages are the size and cost of the large magnet needed, and the difficulty in achieving the high magnetic field values required at the outer edge of the structure. Synchrocyclotrons have not been built since the isochronous cyclotron was developed. Another type of circular accelerator, invented in 1940 for accelerating electrons, is the Betatron, a concept which originates ultimately from Norwegian-German scientist Rolf Widerøe. These machines, like synchrotrons, use a donut-shaped ring magnet (see below) with a cyclically increasing B field, but accelerate the particles by induction from the increasing magnetic field, as if they were the secondary winding in a transformer, due to the changing magnetic flux through the orbit. Achieving constant orbital radius while supplying the proper accelerating electric field requires that the magnetic flux linking the orbit be somewhat independent of the magnetic field on the orbit, bending the particles into a constant radius curve. These machines have in practice been limited by the large radiative losses suffered by the electrons moving at nearly the speed of light in a relatively small radius orbit. 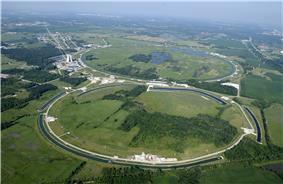 Aerial photo of the Tevatron at Fermilab, which resembles a figure eight. The main accelerator is the ring above; the one below (about half the diameter, despite appearances) is for preliminary acceleration, beam cooling and storage, etc. However, since the particle momentum increases during acceleration, it is necessary to turn up the magnetic field B in proportion to maintain constant curvature of the orbit. In consequence, synchrotrons cannot accelerate particles continuously, as cyclotrons can, but must operate cyclically, supplying particles in bunches, which are delivered to a target or an external beam in beam "spills" typically every few seconds. Since high energy synchrotrons do most of their work on particles that are already traveling at nearly the speed of light c, the time to complete one orbit of the ring is nearly constant, as is the frequency of the RF cavity resonators used to drive the acceleration. Note also a further point about modern synchrotrons: because the beam aperture is small and the magnetic field does not cover the entire area of the particle orbit as it does for a cyclotron, several necessary functions can be separated. Instead of one huge magnet, one has a line of hundreds of bending magnets, enclosing (or enclosed by) vacuum connecting pipes. The design of synchrotrons was revolutionized in the early 1950s with the discovery of the strong focusing concept. The focusing of the beam is handled independently by specialized quadrupole magnets, while the acceleration itself is accomplished in separate RF sections, rather similar to short linear accelerators. Also, there is no necessity that cyclic machines be circular, but rather the beam pipe may have straight sections between magnets where beams may collide, be cooled, etc. This has developed into an entire separate subject, called "beam physics" or "beam optics". More complex modern synchrotrons such as the Tevatron, LEP, and LHC may deliver the particle bunches into storage rings of magnets with constant B, where they can continue to orbit for long periods for experimentation or further acceleration. The highest-energy machines such as the Tevatron and LHC are actually accelerator complexes, with a cascade of specialized elements in series, including linear accelerators for initial beam creation, one or more low energy synchrotrons to reach intermediate energy, storage rings where beams can be accumulated or "cooled" (reducing the magnet aperture required and permitting tighter focusing; see beam cooling), and a last large ring for final acceleration and experimentation. Circular electron accelerators fell somewhat out of favor for particle physics around the time that SLAC's linear particle accelerator was constructed, because their synchrotron losses were considered economically prohibitive and because their beam intensity was lower than for the unpulsed linear machines. The Cornell Electron Synchrotron, built at low cost in the late 1970s, was the first in a series of high-energy circular electron accelerators built for fundamental particle physics, the last being LEP, built at CERN, which was used from 1989 until 2000. 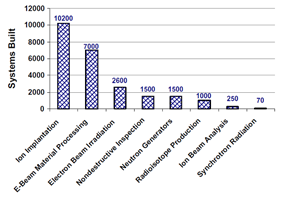 A large number of electron synchrotrons have been built in the past two decades, as part of synchrotron light sources that emit ultraviolet light and X rays; see below. For some applications, it is useful to store beams of high energy particles for some time (with modern high vacuum technology, up to many hours) without further acceleration. This is especially true for colliding beam accelerators, in which two beams moving in opposite directions are made to collide with each other, with a large gain in effective collision energy. Because relatively few collisions occur at each pass through the intersection point of the two beams, it is customary to first accelerate the beams to the desired energy, and then store them in storage rings, which are essentially synchrotron rings of magnets, with no significant RF power for acceleration. Some circular accelerators have been built to deliberately generate radiation (called synchrotron light) as X-rays also called synchrotron radiation, for example the Diamond Light Source which has been built at the Rutherford Appleton Laboratory in England or the Advanced Photon Source at Argonne National Laboratory in Illinois, USA. High-energy X-rays are useful for X-ray spectroscopy of proteins or X-ray absorption fine structure (XAFS), for example. Synchrotron radiation is more powerfully emitted by lighter particles, so these accelerators are invariably electron accelerators. Synchrotron radiation allows for better imaging as researched and developed at SLAC's SPEAR. Fixed-Field Alternating Gradient accelerators (FFAG)s, in which a very strong radial field gradient, combined with strong focusing, allows the beam to be confined to a narrow ring, are an extension of the isochronous cyclotron idea that is lately under development. They use RF accelerating sections between the magnets, and so are isochronous for relativistic particles like electrons (which achieve essentially the speed of light at only a few MeV), but only over a limited energy range for protons and heavier particles at sub-relativistic energies. Like the isochronous cyclotrons, they achieve continuous beam operation, but without the need for a huge dipole bending magnet covering the entire radius of the orbits. Ernest Lawrence's first cyclotron was a mere 4 inches (100 mm) in diameter. Later, in 1939, he built a machine with a 60 in diameter pole face, and planned one with a 184-inch diameter in 1942, which was, however, taken over for World War II-related work connected with uranium isotope separation; after the war it continued in service for research and medicine over many years. The first large proton synchrotron was the Cosmotron at Brookhaven National Laboratory, which accelerated protons to about 3 GeV (1953–1968). The Bevatron at Berkeley, completed in 1954, was specifically designed to accelerate protons to sufficient energy to create antiprotons, and verify the particle-antiparticle symmetry of nature, then only theorized. The Alternating Gradient Synchrotron (AGS) at Brookhaven (1960–) was the first large synchrotron with alternating gradient, "strong focusing" magnets, which greatly reduced the required aperture of the beam, and correspondingly the size and cost of the bending magnets. The Proton Synchrotron, built at CERN (1959–), was the first major European particle accelerator and generally similar to the AGS. The Stanford Linear Accelerator, SLAC, became operational in 1966, accelerating electrons to 30 GeV in a 3 km long waveguide, buried in a tunnel and powered by hundreds of large klystrons. It is still the largest linear accelerator in existence, and has been upgraded with the addition of storage rings and an electron-positron collider facility. 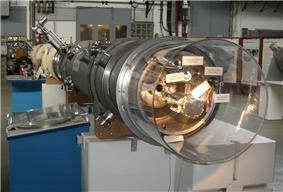 It is also an X-ray and UV synchrotron photon source. The Fermilab Tevatron has a ring with a beam path of 4 miles (6.4 km). It has received several upgrades, and has functioned as a proton-antiproton collider until it was shut down due to budget cuts on September 30, 2011. The largest circular accelerator ever built was the LEP synchrotron at CERN with a circumference 26.6 kilometers, which was an electron/positron collider. It achieved an energy of 209 GeV before it was dismantled in 2000 so that the underground tunnel could be used for the Large Hadron Collider (LHC). The LHC is a proton collider, and currently the world's largest and highest-energy accelerator, expected to achieve 14 TeV energy per beam, and currently operating at half that. The aborted Superconducting Super Collider (SSC) in Texas would have had a circumference of 87 km. Construction was started in 1991, but abandoned in 1993. Very large circular accelerators are invariably built in underground tunnels a few metres wide to minimize the disruption and cost of building such a structure on the surface, and to provide shielding against intense secondary radiations that occur, which are extremely penetrating at high energies. Current accelerators such as the Spallation Neutron Source, incorporate superconducting cryomodules. The Relativistic Heavy Ion Collider, and Large Hadron Collider also make use of superconducting magnets and RF cavity resonators to accelerate particles. The output of a particle accelerator can generally be directed towards multiple lines of experiments, one at a given time, by means of a deviating electromagnet. This makes it possible to operate multiple experiments without needing to move things around or shutting down the entire accelerator beam. Except for synchrotron radiation sources, the purpose of an accelerator is to generate high-energy particles for interaction with matter. This is usually a fixed target, such as the phosphor coating on the back of the screen in the case of a television tube; a piece of uranium in an accelerator designed as a neutron source; or a tungsten target for an X-ray generator. In a linac, the target is simply fitted to the end of the accelerator. The particle track in a cyclotron is a spiral outwards from the centre of the circular machine, so the accelerated particles emerge from a fixed point as for a linear accelerator. For synchrotrons, the situation is more complex. Particles are accelerated to the desired energy. Then, a fast acting dipole magnet is used to switch the particles out of the circular synchrotron tube and towards the target. A variation commonly used for particle physics research is a collider, also called a storage ring collider. Two circular synchrotrons are built in close proximity – usually on top of each other and using the same magnets (which are then of more complicated design to accommodate both beam tubes). Bunches of particles travel in opposite directions around the two accelerators and collide at intersections between them. This can increase the energy enormously; whereas in a fixed-target experiment the energy available to produce new particles is proportional to the square root of the beam energy, in a collider the available energy is linear. A Livingston chart depicting progress in collision energy through 2010. 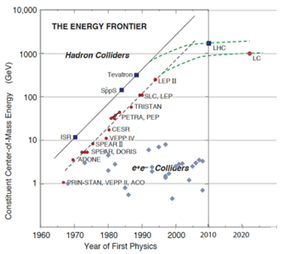 The LHC is the largest collision energy to date, but also represents the first break in the log-linear trend. At present the highest energy accelerators are all circular colliders, but both hadron accelerators and electron accelerators are running into limits. Higher energy hadron and ion cyclic accelerators will require accelerator tunnels of larger physical size due to the increased beam rigidity. For cyclic electron accelerators, a limit on practical bend radius is placed by synchrotron radiation losses and the next generation will probably be linear accelerators 10 times the current length. An example of such a next generation electron accelerator is the 40 km long International Linear Collider, due to be constructed between 2015–2020. It is believed that plasma wakefield acceleration in the form of electron-beam 'afterburners' and standalone laser pulsers might be able to provide dramatic increases in efficiency over RF accelerators within two to three decades. 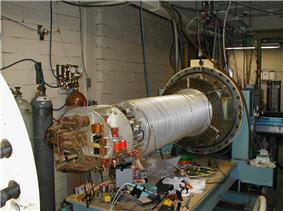 In plasma wakefield accelerators, the beam cavity is filled with a plasma (rather than vacuum). A short pulse of electrons or laser light either constitutes or immediately trails the particles that are being accelerated. The pulse disrupts the plasma, causing the charged particles in the plasma to integrate into and move toward the rear of the bunch of particles that are being accelerated. This process transfers energy to the particle bunch, accelerating it further, and continues as long as the pulse is coherent. Energy gradients as steep as 200 GeV/m have been achieved over millimeter-scale distances using laser pulsers and gradients approaching 1 GeV/m are being produced on the multi-centimeter-scale with electron-beam systems, in contrast to a limit of about 0.1 GeV/m for radio-frequency acceleration alone. Existing electron accelerators such as SLAC could use electron-beam afterburners to greatly increase the energy of their particle beams, at the cost of beam intensity. Electron systems in general can provide tightly collimated, reliable beams; laser systems may offer more power and compactness. Thus, plasma wakefield accelerators could be used – if technical issues can be resolved – to both increase the maximum energy of the largest accelerators and to bring high energies into university laboratories and medical centres. Higher than 0.25 GeV/m gradients have been achieved by a dielectric laser accelerator, which may present another viable approach to building compact high-energy accelerators. In the future, the possibility of black hole production at the highest energy accelerators may arise if certain predictions of superstring theory are accurate. This and other exotic possibilities have led to public safety concerns that have been widely reported in connection with the LHC, which began operation in 2008. The various possible dangerous scenarios have been assessed as presenting "no conceivable danger" in the latest risk assessment produced by the LHC Safety Assessment Group. If black holes are produced, it is theoretically predicted that such small black holes should evaporate extremely quickly via Bekenstein-Hawking radiation, but which is as yet experimentally unconfirmed. If colliders can produce black holes, cosmic rays (and particularly ultra-high-energy cosmic rays, UHECRs) must have been producing them for eons, but they have yet to harm anybody. It has been argued that to conserve energy and momentum, any black holes created in a collision between an UHECR and local matter would necessarily be produced moving at relativistic speed with respect to the Earth, and should escape into space, as their accretion and growth rate should be very slow, while black holes produced in colliders (with components of equal mass) would have some chance of having a velocity less than Earth escape velocity, 11.2 km per sec, and would be liable to capture and subsequent growth. Yet even on such scenarios the collisions of UHECRs with white dwarfs and neutron stars would lead to their rapid destruction, but these bodies are observed to be common astronomical objects. Thus if stable micro black holes should be produced, they must grow far too slowly to cause any noticeable macroscopic effects within the natural lifetime of the solar system. ^ Witman, Sarah. "Ten things you might not know about particle accelerators". Symmetry Magazine. ^ "Six Million Volt Atom Smasher Creates New Elements". ^ Higgins, A. G. (December 18, 2009). "Atom Smasher Preparing 2010 New Science Restart". ^ Cho, A. (June 2, 2006). "Aging Atom Smasher Runs All Out in Race for Most Coveted Particle". ^ Feder, T. (2010). "Accelerator school travels university circuit". ^ Hamm, Robert W.; Hamm, Marianne E. (2012). Industrial Accelerators and Their Applications. World Scientific. ^ "CERN management confirms new LHC restart schedule" (Press release). ^ "CERN reports on progress towards LHC restart" (Press release). ^ "Two circulating beams bring first collisions in the LHC" (Press release). ^ Nagai, Y.; Hatsukawa, Y. (2009). "Production of 99Mo for Nuclear Medicine by 100Mo(n,2n)99Mo". ^ Amos, J. (April 1, 2008). "Secret 'dino bugs' revealed". ^ Zimmermann, F.; Mess, eds. (2013). Handbook of Accelerator Physics and Engineering (2nd ed.). World Scientific. ^ Blewett, J. P. (1952). "Radial Focusing in the Linear Accelerator". ^ "The Alternating Gradient Concept". ^ "World of Beams Homepage". ^ Clery, D. (2010). "The Next Big Beam?". ^ Wright, M. E. (April 2005). "Riding the Plasma Wave of the Future". ^ Briezman, B. N.; et al. "Self-Focused Particle Beam Drivers for Plasma Wakefield Accelerators". Retrieved 2005-05-13. ^ Peralta, E. A.; et al. "Demonstration of electron acceleration in a laser-driven dielectric microstructure". Retrieved 2014-05-01. ^ "An Interview with Dr. Steve Giddings". ^ Chamblin, A.; Nayak, G. C. (2002). "Black hole production at the CERN LHC: String balls and black holes from pp and lead-lead collisions". ^ a b Ellis, J.; et al. ^ Jaffe, R.; Busza, W.; Sandweiss, J.; Wilczek, F. (2000). "Review of Speculative "Disaster Scenarios" at RHIC". What are particle accelerators used for? P.J. Bryant, A Brief History and Review of Accelerators (PDF), CERN, 1994. Ragnar Hellborg (ed. ), ed. (2005). Electrostatic Accelerators: Fundamentals and Applications. Springer. Accelerators-for-Society.org, to know more about applications of accelerators for Research and Development, energy and environment, health and medicine, industry, material characterization. See also the categories Radiation effects, Radioactivity, and Radiobiology.